I once had a picnic in Tamaran. It was quite nice because I ate a massive flan. Or maybe it was apple? As I scoffed it by a chapel. A location that makes exceedingly exquisite jam. I won't tell you what these guys ate though. Writer: Scott Lobdell; Artist: Timothy Green II; and Publisher: DC Comics in August 2012. It had pecan nuts in it. Yuck. The family doctor once said to my older brother that for him to stop having continual head-aches, he should go out more often and do different things. So in turn, my brother went into my father's garden and tried to smoke a tree. Physically. OK, I'm sure that you'll agree with me that this is a very strange thing for him to do. Though this story entitled 'We Are Family, Come On Everybody And Die' is just as strange, although it is set in space. You see, simply put, Kori's sister -- Queen Komand'r, also known as Blackfire -- thought that by having Roy (Arsenal) Harper in her captive, that everything would be fine for her and her pug-ugly compadres. They listen to him tell a tale about Jay, Kori, the ship, the stewardess, and the manner in which all seems to go to pot for this small rebel crew -- especially when Roy is zapped away. However, once Roy has finished telling his story, he does something that he never explained in his earlier narrative. He transports the Queen all the way back to her sister, leading into a very emotional reunion I can tell you. Meanwhile, whilst all of this is going on, some ugly looking skeleton kills a Colonel for some reason I am not too sure of yet. To be continued just as soon as two siblings prepare for some target practice. POW! Although I shouldn't have found it amusing, I did find it funny when K'tten said 'I am surprised that human's aren't as dumb as people say they are', mainly because she was smiling like a simpleton whilst she was saying it. Now I've always been a right sucker for a circular narrative. You know what I mean by this, right? When a story starts off at one point in the tale, and then takes us on a journey all the way back to the beginning again. Moreover, I like it when the tale-end of this conclusion has more substance behind it as well. Because it reminds me of a cherry on top of a cake -- so to speak. Maybe it was just me, but the majority of this odyssey felt a bit too much like exposition and filler to really hold water. Honestly, I normally like Scott's writing an awful lot. But I am afraid to say that it did let him down this time round. Most of it was too staged for my own taste, as if to delay something coming up on the horizon --possibly the 0 issue. STORY: Now I'm not sure why all of a sudden Roy's cleverness has taken a spring in the right direction, but for me, this was a very welcome and innovative turn up for the books. Very nicely done. And not in a 'what the f*ck' type way either. 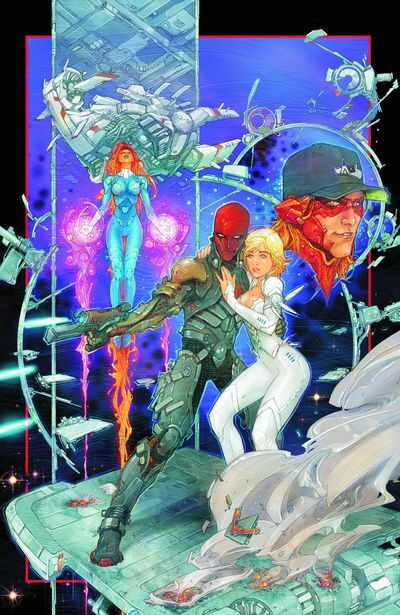 ART: To put it bluntly, Timothy Green II is nothing like Kenneth Rocafort I. Don't get me wrong, I'm sure that I could warm up to Tim's work over time -- as he does illustrate very nice and vivid facial expressions. Though for him to step into Ken's shoes at this precise moment? No. Doesn't feel right to me -- especially whilst trying to mirror Rocaforts style. K'TTEN: If Avril Lavigne could tan as well as this orange-faced punk-pilot, then I'm sure that we would have a perfect casting match on our hands. Anyone got a tin of paint? Ha! COLONEL: For this soon to be dead space-octogenarian, we need an old actor who is very good at saying it like it is and then lying down. 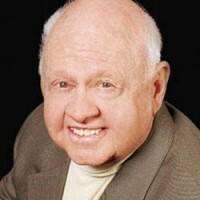 What about Mickey Rooney? Or is that too controversial? Re-Unions Are Hard To Come By In Deep Outer Space. First You Need The Fuel. Second You Need A Sucker. And Third You Need A Teleporter. BOOM! Conceptually this story is an uplifting tale of deceptions and reunions, so why not compare it to an uplifting and adventurous song like the O'Jay's classic, 'Family Reunion'. As much as I wasn't a hundred percent happy with this issue, I have to confess, that it did throw up a number of questions that will keep my curiosity buzzing for the next month or so. Like who was that skeleton faced-sod who killed that Army Captain? Why do Blackfire and Harley Queen have a similar way of putting on their own make-up? And who will replace Ken on this book when he fly's off to Superman? Questions. Questions. Questions. Huh? You got to love a question. Does anybody have any answers? Ha!